Why is the open value never the same as the previous day's close value? This is something I just don't get: on all the candlestick graphs, you can see that it is very often very close, but never exactly the same value. How come? What are the movements happening between one day's "close" and the next day's "open"? And who's "playing" on that? What most of these answers here seem to be missing is that a stock "price" is not exactly what we typically expect a price to be--for example, when we go in to the supermarket and see that the price of a gallon of milk is $2.00, we know that when we go to the cash register that is exactly how much we will pay. This is not, however, the case for stocks. For stocks, when most people talk about the price or quote, they are really referring to the last price at which that stock traded--which unlike for a gallon of milk at the supermarket, is no guarantee of what the next stock price will be. Relatively speaking, most stocks are extremely liquid, so they will react to any information which the "market" believes has a bearing on the value of their underlying asset almost (if not) immediately. As an extreme example, if allegations of accounting fraud for a particular company whose stock is trading at $40 come out mid-session, there will not be a gradual decline in the price ($40 -> $39.99 -> $39.97, etc.) -- instead, the price will jump from $40 to say, $20. In the time between the the $40 trade and the $20 trade, even though we may say the price of the stock was $40, that quote was actually a terrible estimate of the stock's current (post-fraud announcement) price. Considering that the "price" of a stock typically does not remain constant even in the span of a few seconds to a few minutes, it should not be hard to believe that this price will not remain constant over the 17.5 hour period from the previous day's close to the current day's open. Don't forget that as Americans go to bed, the Asian markets are just opening, and by the time US markets have opened, it is already past 2PM in London. In addition to the information (and therefore new knowledge) gained from these foreign markets' movements, macro factors can also play an important part in a security's price-- perhaps the ECB makes a morning statement that is interpreted as negative news for the markets or a foreign government before the US markets open. Stock prices on the NYSE, NASDAQ, etc. won't be able to react until 9:30, but the $40 price of the last trade of a broad market ETF at 4PM yesterday probably isn't looking so hot at 6:30 this morning... don't forget either that most individual stocks are correlated with the movement of the broader market, so even news that is not specific to a given security will in all likelihood still have an impact on that security's price. The above are only a few of many examples of things that can impact a stock's valuation between close and open: all sorts of geopolitical events, announcements from large, multi-national companies, macroeconomic stats such as unemployment rates, etc. announced in foreign countries can all play a role in affecting a security's price overnight. As an aside, one of the answers mentioned after hours trading as a reason--in actuality this typically has very little (if any) impact on the next day's prices and is often referred to as "amateur hour", due to the fact that trading during this time typically consists of small-time investors. Prices in AH are very poor predictors of a stock's price at open. NASDAQ has come up with an auction approach called the opening cross. Here's how it works. In the morning, a computer program looks at all the orders that have come in overnight in each different stock. Based on those orders, the program picks a price level that would be the best opening price. However, it also looks to see if there's a trade imbalance. For example, if a company announced bad news after the market closed, there might be 10 times more sell orders than buy orders. NASDAQ then broadcasts the price and imbalance information to its network of dealers with the goal of offsetting the imbalance. It then lets dealers place orders. This all happens very quickly, in a time window of two minutes or so, right before the market opens. Dealers can place orders, and those orders are factored into the opening price. A stock's price does not move in a completely continuous fashion. It moves in discrete steps depending on who is buying/selling at given prices. I'm guessing that by opening bell the price for buying/selling a particular stock has changed based on information obtained overnight. A company's stock closes at $40. Overnight, news breaks that the company's top selling product has a massive defect. The next morning the market opens. Are there any buyers of the stock at $40? Probably not. The first trade of the stock takes place at $30 and is thus, not the same as the previous day's close. The Opening Auction Between 07.50 and a random time between 08.00 and 08.00.30, there will be called an auction period during which time, limit and market orders are entered and deleted on the order book. No order execution takes place during this period so it is possible that the order book will become crossed. This means that some buy and sell orders may be at the same price and some buy orders may be at higher prices than some sell orders. At the end of the random start period, the order book is frozen temporarily and an order matching algorithm is run. This calculates the price at which the maximum volume of shares in each security can be traded. All orders that can be executed at this price will be filled automatically, subject to price and priorities. No additional orders can be added or deleted until the auction matching process has been completed. The opening price for each stock will be either a 'UT' price or, in the event that there are no transactions resulting form the auction, then the first 'AT' trade will be used. The simple answer: The opening price is the price of the first trade of the day and the closing price is the price of the last trade of the day. And since the stock price change from trade to trade they are usually different. The two answers so far are right, but there's a third factor - for many stocks, there's after hours trading. So the official 4PM close is not what the stock's last trade was when they open again. Regardless, even that after hour price is not the starting point as Muro points out. Besides overnight news events and auction mechanisms there is a more fundamental reason the price of a stock is always moving. Theoretically the stock price will move slightly even in the unlikely scenario that absolutely nothing of interest happens during the entire night. Now take the Close price C, and the open price O. Let's assume that since there has been no news, the expectations for future earnings are the same for C and O. Remember that the discounting factor for these earnings is dependent on the time until the cashflow occurs? For O, this time is slightly shorter than for C, and therefore the value will be slightly higher (or lower, when the company is expected to incur losses). So now you can see that even without all the external forces that continuously push and pull on the stock price, a stock still changes in value over time. It's almost like why don't you wake up in the morning feeling exactly like you slept the earlier night? yeah, once in a while that'll happen, but it's not designed to be that way. Stuff happens. The close of the stock is what happened at 4 PM (for US stocks). The "open" is simply the first price ever, or an open price auction like NimChimpsky said. Most things that trade have an open/close cycle, even what seemingly trades all the time (some markets trade 23 hours). Forex trades in different exchanges which have overlapping timing but each market will have an open, high, low and close for each day - for what is the same underlying currency. Also, it's not exactly true that close<>open. Take the GS chart, Oct 1 2010 and Oct 4 2010 (there was a weekend in between). 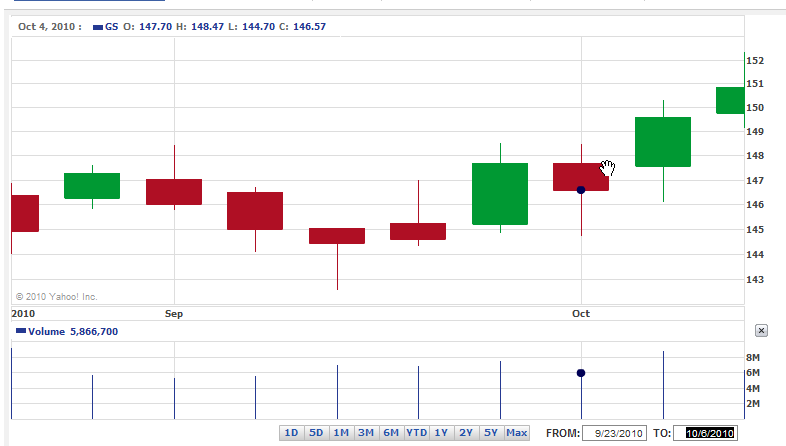 The Oct 1 close was the same as the Oct 4 open. Note that Oct 4 was a down day so it's in red - the open is the upper end of the body (not including the wick), and Oct 1 was an up day so its close was the upper end too. The way to get to this: Go to yahoo finance, choose a stock, go to historical prices, click download data (you should have about 10 years of data), paste into excel, insert a formula to check if prev day's close = current day's open, and I'm sure you'll see at least one instance per stock. It does sometimes open one day the same as it closed the previous day. Take a look at ESCA, it closed October 29th at 4.50, at opened November 1st at 4.50. It's more likely to change prices overnight than it is between two successive ticks during the day, because a lot more time passes, in which news can come out, and in which people can reevaluate the stock. A lot can happen between the time a stock closes on one day and opens on another. Particularly in a heavily traded stock such as IBM. Basically, you have a different "information set" the following day, which implies a different price. The instances where you are most likely to have a stock where the price opens at the same price is at the previous close is a thinly traded stock on which you have little information, meaning that the "information set" changes less from day to day. Nobody has mentioned the futures market yet. Although the stock market closes at 4pm, the futures market continues trading 24 hours a day and 5.5 days a week. Amongst the products that trade in the future market are stock index futures. So normal market fluctuations coupled with macroeconomic events affect the futures market, which can ripple down to individual stocks. Very popular stocks with large market caps will most certainly be affected by futures market trading. But it is also worth mentioning that futures can function completely independently of a "spot" price. This is where things start to get complicated and long winded. The futures market factor is worth mentioning because it extends even outside of the aftermarket and pre-market hours of stock trading. A stock is only worth what someone is willing to pay for it. If it trades different values on different days, that means someone was willing to pay a higher price OR someone was willing to sell at a lower price. There is no rule to prevent a stock from trading at $10 and then $100 the very next trade... or $1 the very next trade. (Though exchanges or regulators may halt trading, cancel trades, or impose limits on large price movements as they deem necessary, but this is beside the point I'm trying to illustrate). Asking what happens from the close of one day to the open of the next is like asking what happens from one trade to the next trade... someone simply decided to sell or pay a different price. Nothing needs to have happened in between. Not the answer you're looking for? Browse other questions tagged stocks stock-exchanges price technical-analysis or ask your own question. how stock market sale work? how an order is matched after a fill? Is the concept of an “odd lot” adjusted to stock price? Why have candlestick charts overlaps?